Here's a list of Chapter 2 - A.I.M For The Stars Task Missions that you need to complete in order to Master the Chapter. You may also use the Chapter 2 Missions and Stages below as your reference for finding locations of certain enemies or villains. Kindly note that the "How to Complete" section below are just suggestions based from my gameplay experience and available heroes, so they are not the only way to complete the task. - You can tap+hold enemies during a fight to check more info like their names. - The free Hero Reward for Mastering Chapter 2 is M.O.D.O.K..
- Task: Avoid Living Laser's Attacks with Guarded in Mission 2.1 or 2.5 [5 Times]. - How to Complete: Example Heroes with Guarded buff: Spider-Man's Spider Sense and Captain America's (Age of Ultron) Walk It Off. If it didn't work, just Dodge his attacks by using high evasion Heroes like Wasp, it will count. Yes, I also think this task is bugged. - Task: Use an Energy attack on Blizzard in Mission 2.1 or 2.4 [3 Times]. - How to Complete: Some of the common heroes with lots of Energy attacks are: Iron Man, Captain Marvel, War Machine, Vision, and more. Either use your own hero, or team-up heroes. - Task: Defeat Fixer in Mission 2.1. - How to Complete: Defeat the Final Boss in Mission 1. - Task: Team-up with Ally Blasters [5 Times]. - How to Complete: Team-Up with any Blaster, but the Hero must be your Ally to count. Add more Blaster Heroes as your friend in-game if you need more, then try again. - Task: Defeat Crimson Dynamo in Mission 2.2. - How to Complete: Defeat the Final Boss in Mission 2. - Task: Defeat Ghost in Mission 2.3. - How to Complete: Defeat the Final Boss in Mission 3. - Task: Defeat Elite Ultron Mk II in Mission 2.5 or 2.6. - How to Complete: Hmm I was able to complete this just by finishing Mission 2. Anyway, just find and defeat it. - Task: Defeat Graviton in Mission 2.4. - How to Complete: Defeat the Final Boss in Mission 4. - Task: Defeat Ultron's Army in Mission 2.5 or 2.6 [25 Times]. - How to Complete: You can find them from Missions 3 to 6. Enter Army of Ultron stages and defeat them. - Task: Defeat Scientist Supreme in Mission 2.5. - How to Complete: Defeat the Final Boss in Mission 5. - Task: Defeat Elite Ultron Heavy in Mission 2.5 or 2.6. - How to Complete: I think Mission 4 is enough for this task. - Task: Defeat A.I.M Mecho-Troopers in Mission 2.5 or 2.6 [5 Times]. - How to Complete: Enter AIM stages and defeat them. Maybe it's a bug but A.I.M Mecho-Troopers that you encounter from Lvl 20 Scouting Missions also counts. - Task: Defeat M.O.D.O.K. in Mission 2.6. - How to Complete: Defeat the Final Boss in Mission 6. - Task: Defeat M.O.D.O.K. with all Heroes using their left-most ability ONLY to affect him in Mission 2.6. - How to Complete: You can use Recharge or Tactical abilities and other Buffs, but you can't use Attacks and Debuffs on him that are equipped on your Heroes' 2nd or 3rd ability slots. - How to Complete: If you are having trouble, just wait and return once your heroes can dish massive damages. - Note: I only listed the Hard Mode path for reference, you may take the shortest route (lower Combat Lvl) if you just need to finish the Mission. Hard Mode Missions are those with higher Combat Lvl requirement. - Task: Defeat Tactical Force with a Tactician in Mission 2.2. - How to Complete: He is the 1st Mini Boss in Mission 2, just make sure you have a Tactician present once he is defeated. Either use your own hero, or team-up heroes. - Task: Defeat Hammer with a Scrapper in Mission 2.2. - How to Complete: He is the 2nd Mini Boss in Mission 2, just make sure you have a Scrapper present once he is defeated. Either use your own hero, or team-up heroes. - Task: Defeat Green Goblin using damage from Wounded in Mission 2.3. - How to Complete: He is the 3rd Mini Boss in Mission 3. I defeated him using the Wounded effect's damage as the last hit, so I'm not sure if by just inflicting the Wounded debuff already counts. Check Heroes that can inflict the Wounded effect here: Uncategorized Debuffs List. - Task: Defeat Lizard with a Blaster in Mission 2.4. - How to Complete: He is the 2nd Mini Boss in Mission 4, just make sure you have a Blaster present once he is defeated. Either use your own hero, or team-up heroes. - Shorter and Easier route: Follow Normal Mode Missions and Stages above. - Longer and Harder route: Follow Hard Mode Missions and Stages above. - I also recommend Wasp here as tank. Aim for around 2500 to all stats except Attack (optional) and Evasion (as high as possible). If needed, do not follow the color of her tiles when equipping Iso-8 Crystals. Except Purple Tiles though, you need high evasion. - Same with your other Heroes: DPS, Healers or Support, increase their stats to around 2500, especially Health. Notable stat/s should be higher than the rest, your choice. - Also try to add more strong Team-Up heroes that can aid you with your battles, preferably the ones that can inflict Static Shock debuffs. - Check Heroes that can inflict Static Shocks here: Physical Debuffs List. Take your time and level up Electro, he is a nice addition for your Static Shock Team. - If you just need Wasp to tank and try other team compositions, that is also cool. - The more Lvl 30 2 to 3-Star Heroes you have, the better. - Task: Beat the Hydra Four in a single combat in Mission 2.2. 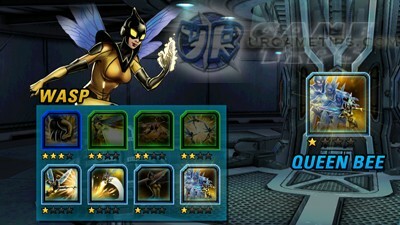 - How to Complete: For Wave 3, Bowman can really hurt your Wasp, so eliminate him asap. - Example Team: Wasp + Healer like Iron Fist + DPS hero. I used Star Lord from ally Team-Up for his Frenzied buff (fast kill), Stun, and Static Shock debuff. He also works well with Iron Fist. - You can also put your Healer as reserve, to use 2 DPS heroes, then swap to your Healer if you need healing, keep your Health at full though. - If you are using Black Widow, use Widow's Kiss to remove Bowman's Focused buff. - Task: Defeat Epic Boss Baron Strucker in Mission 2.2. - How to Complete: Baron Strucker isn't really a challenge, the problem is that you'll encounter Bowman together with the first Wave. Plus, the other 2 enemies can also use AoE attacks, and when you reduce their HP to below 50%, they will buff up Bowman's Accuracy! So better eliminate Bowman fast without harming the other 2. Start with a healer and a DPS hero. - Example Team: Same as above, best if you can find a 3-Stars DPS hero as ally Team-Up like Star Lord. 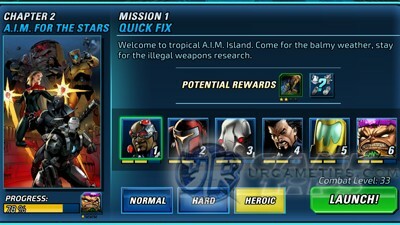 - Task: Defeat Epic Boss Ultron in Mission 2.6. - How to Complete: As you progress through the stages, just keep using Wasp's Bioenergy Blast to shatter shields. Epic Ultron is pretty much the same as the earlier Army of Ultron stages you encountered. - Example Team: Tank + Healer + DPS Hero, or Tank + 2 DPS heroes + 1 reserved Healer. - Note: He will gain a Focused buff if you will use a Blaster, so if possible, do not use one here. - Task: Kill Epic Ultron with the Bleeding debuff in Mission 2.6 (3 Times). - How to Complete: OK, this is a weird task, but do this first. Enter any Army of Ultron stages (any difficulty), then inflict the Bleeding Debuff 3 times into a single Ultron (any will do and just attack 3 times). If it worked, then good, but if it didn't, just try again, or do it against Epic Ultron. - Check Heroes that can inflict the Bleeding effect here: Physical Debuff Effects and Heroes. - Task: Complete all Mission in Chapter 2 on each difficulty. - How to Complete: Complete all Normal, Hard, and Heroic Modes. 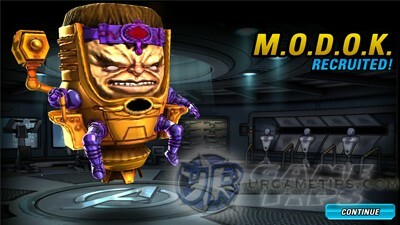 Chapter 2 Mastery Reward: M.O.D.O.K. - M.O.D.O.K. is also a pretty good hero for Shield based teams, Energy and/or Blast teams. Helpful for protecting and boosting heroes that benefits from shields like Iron Man. Also share your team and strategies below to help other players!